Just like Hanie’s Boulangerie the Sundial Pizza Company has given students a special option to build their own creations, with pizza! 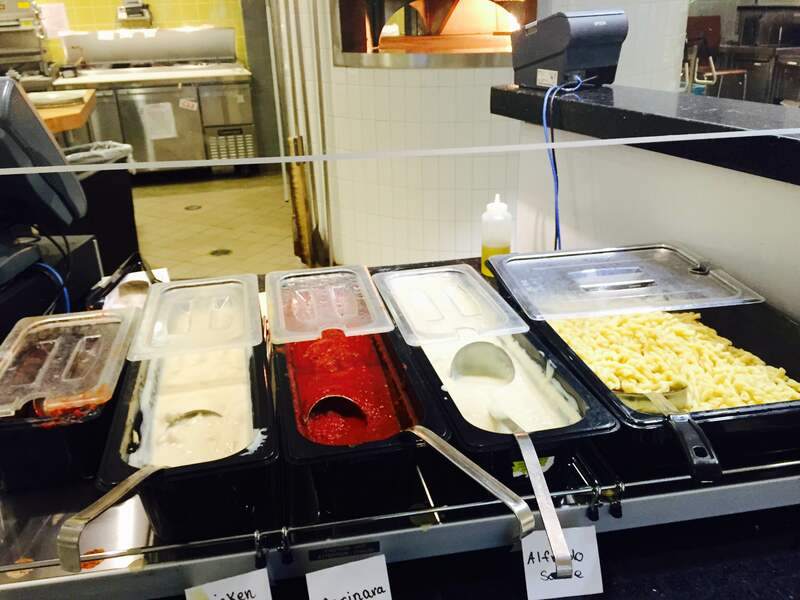 First students pick a base sauce, either alfredo or tomato. Then they can load up on all the veggie toppings Sundial has to offer, from crunchy green peppers to fresh artichokes! Finally they choose which proteins they want like pepperoni, sausage, ham, bacon, or chicken! 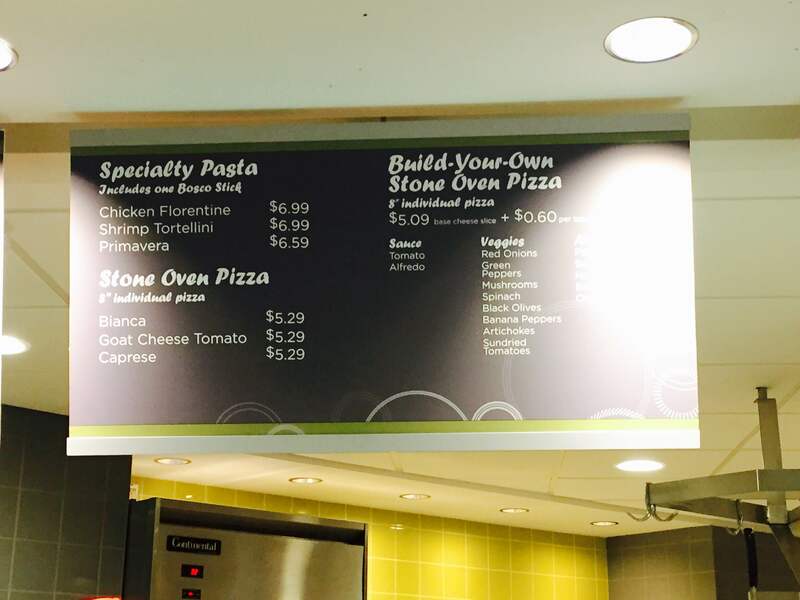 Once their pizza creation comes out of the stone oven, fresh-baked and hot, students can also choose to add a side of pasta to go! It’s fast, easy, and all self served! Also still available as a side are salad bowls, fruit cups, cheese cubes, veggie slices with ranch, and deli sandwiches in the cold fridge section! Just bring it up to the cashier when you’re ready to check out and they’ll add it to your order! Don’t forget to grab a drink too! So whichever way you like your pizza made come #EatWithUs at the Sundial in Armstrong, and send us your craziest pizza combinations pics to @MiamiUDining on Twitter! Haines’ Boulangerie: Now Made Just For You! 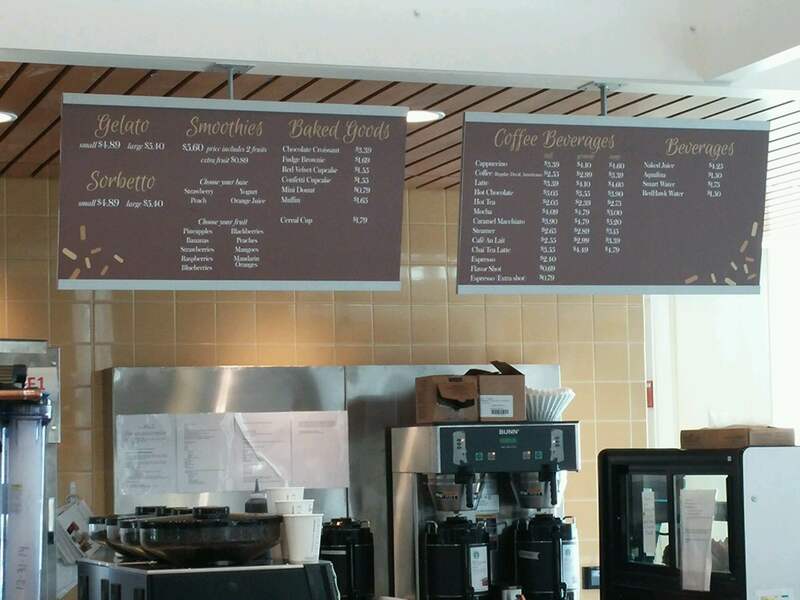 Haine’s Boulangerie, located inside the Armstrong Student Center right below Pulley, has now made a entirely customizable menu featured to give each student exactly what they want! Haine’s has also made their salad bowls customizable as well! Now featured more as a “pick and choose” salad bar, students can choose what greens, garnishes, and proteins they want added by just requesting it to the cashier! Still featured as sides at Haine’s will be their yummy hot soups, including the sour cream of potato soup (which I highly recommend to dip your sandwich in) as well as the saratoga chips, fresh fruit, and quinoa & chickpea tabbouleh! 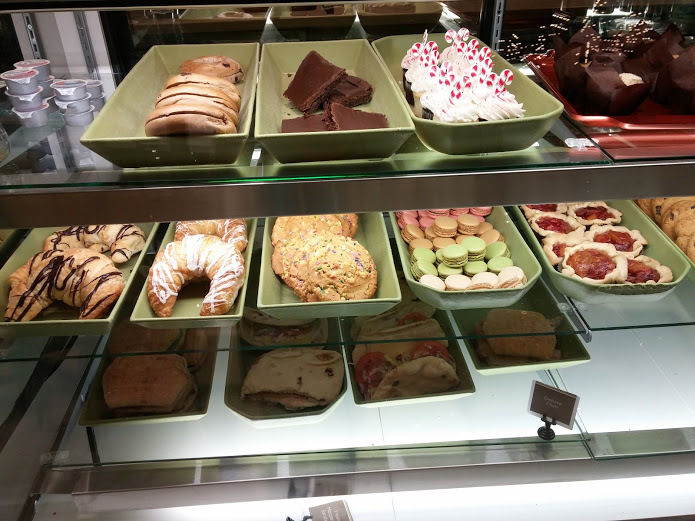 If you’re in the mood for something sweet pick out something nice and warm from the Bakery! They have fluffy cinnamon rolls, soft muffins, and macadamia nut cookies! So come one, come all, (including the picky eaters) and #EatWithUs because this time were serving it up exactly your way and can’t wait to see what combinations you will find! Start Your Winter Off Right, With Miami Ice! With the winter air starting to blow in at chilling temperatures here at Miami Oxford students working through J-Term need to remember to stay warm in between classes! Here’s a tip that might make the cold a little more bearable! Swing (or Slide) on by to Miami Ice, normally known for their delicious assortments of ice cream and gelatos, but instead order a piping hot beverage to keep yourself nice and toasty! With such a wide variety of choices you can pick something fancy like a caramel macchiato, a nice buzz of espresso, or if coffee isn’t your thing, a big ol’ cup of hot chocolate! Along with the steamy beverages to choose from, (did I forget to mention the never ending choices of hot tea), you can also grab a seasonal cupcake “to go”, or even a fresh baked muffin to munch on your way to class! 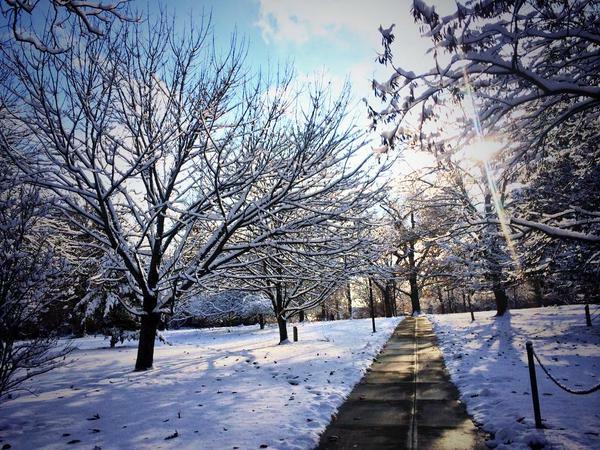 Whatever treat you choose continue to stay bundled up and enjoy these last few weeks before the Spring Semester! It may be cold out and snowy but Oxford remains a beautiful sight this Winter, don’t let the chills distract you from the scenery! 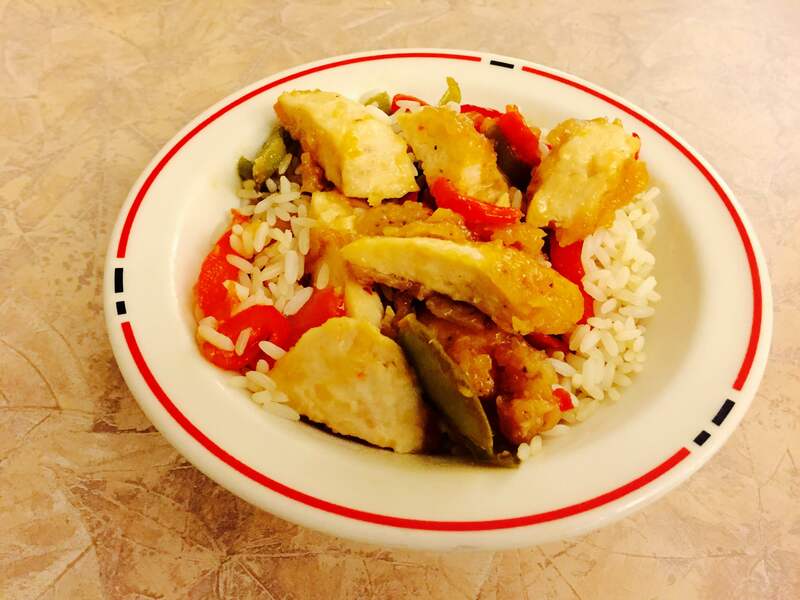 Now featured at Martin Dining Hall every Monday, Wednesday, and Friday there will be a variety of rices and meats available for dinner from the Wok Express! This includes Beef Broccoli, Orange Chicken, Fried Rice, White Rice, Lo Mein Noodles and more! With the food all lined up in a nice buffet style variety you can mix and match all your favorite dishes and still come back for extra! We loaded up our dishes with lots of white rice and orange chicken with a dash of soy sauce! Everything was fresh and piping hot and because it’s “self serve” the line moved very quickly! After we chowed down on our sweet and spicy meal we peeked over to the dessert cart to find endless raspberry cheesecake available to all the students! The perfect ending to a great meal! So come #EatWithUs and try out the new Wok Express! 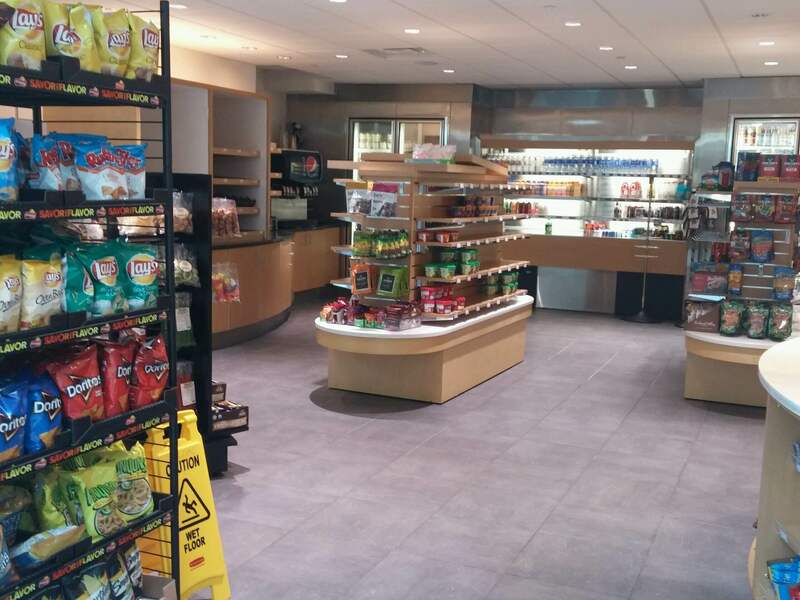 A convenience shop opened for the fellow students of Miami can be found on the upper level of Armstrong, behind Pulley Diner, ready to satisfy all your snack cravings or last minute purchases. Need some Burt’s Bees chapstick, a quick stick of deodorant, or even a new notebook before class? Don’t want to waste time traveling off campus; the Emporium has got you covered! Along with a variety of items ranging from pencils to Advil, the Emporium also has the delicious munchables every college student craves—chips, whole candy bars, and all the microwavable meals you can imagine. (Did I forget to mention Lean Cuisines and Ben and Jerry’s Ice Cream located in the back freezer? YUM!) Even the healthy eaters here on campus can indulge here with packages of dried fruit jerky and trail mix to-go. 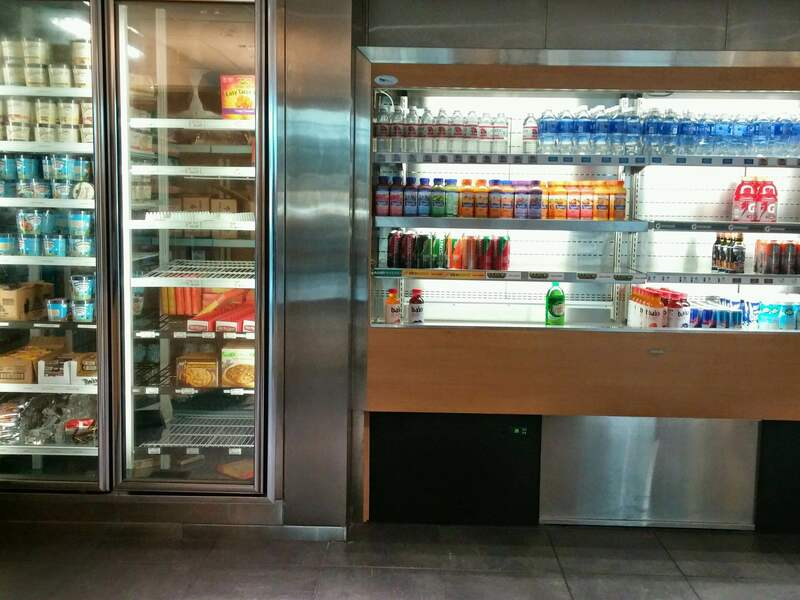 The Emporium also knows you need something to wash down your treats (like their array of fresh bagels or Lunchables), so they have given students a whole section of ice cold drinks! 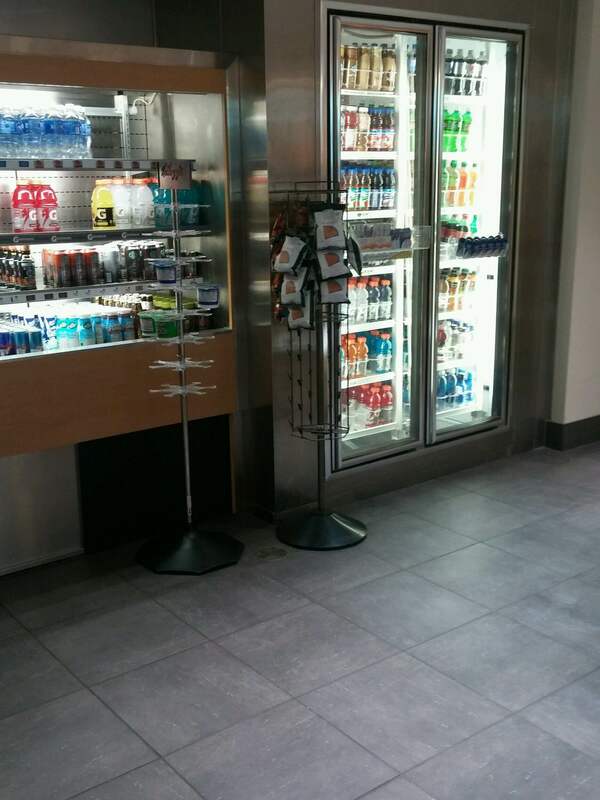 You can choose from raspberry teas, liters of water, Gatorade, and even creamsoda in the bottle. So, check out the Emporium. I’m sure they will have something to fill your snack cravings and maybe even get you to branch out and try something new. Come #EatWithUs and enjoy it on the go! 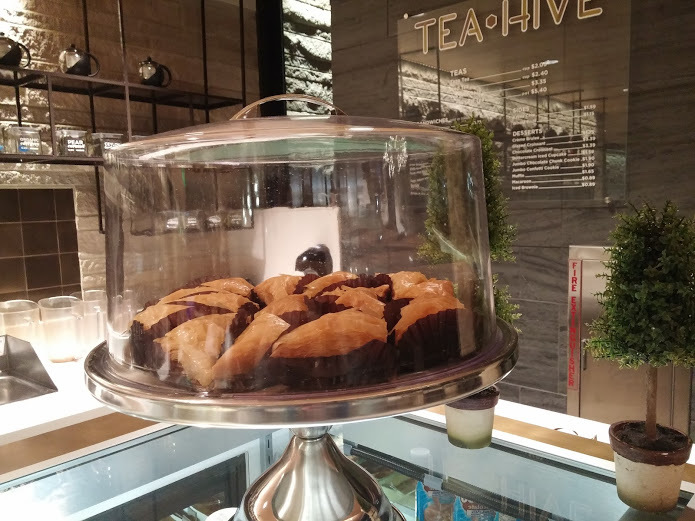 Located inside The Western Dining Commons the Tea Hive is a perfect cozy location to grab a quick sweet treat, a deli sandwich, and a nice hot cup of tea. 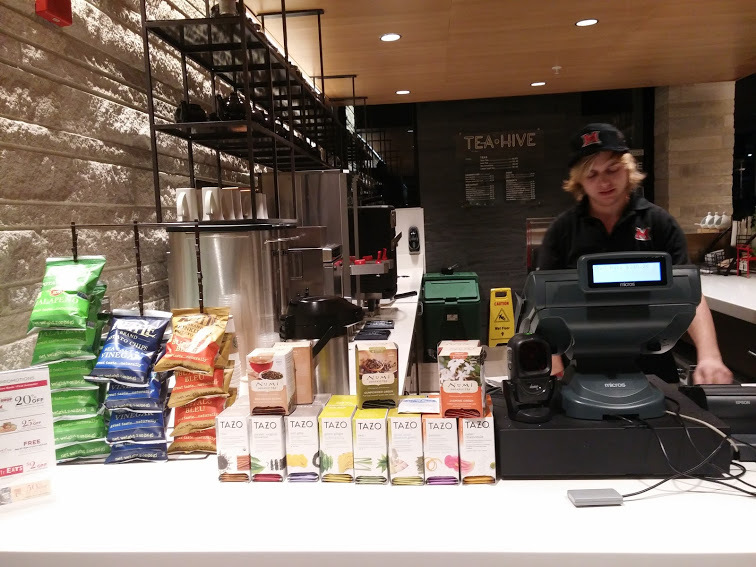 Last week there was a special “Tea Hive After Dark” hours for students wishing to unwind and stay late to study for their finals! They even extended their menu to now include coffee for an added bonus! The Tea Hive will be the excellent choice to add a little happiness to your day! So sit back, relax, and come #EatWithUs! We know how uncomfortable it can be to explore new areas of the campus. With this blog, we hope to make that experience a little more enjoyable by giving you the run down of days, times, menus, and even how to order food at each dining location. Western Dining Commons is on Western Campus—one of the most gorgeous areas of the campus—about ten minutes away from Armstrong. 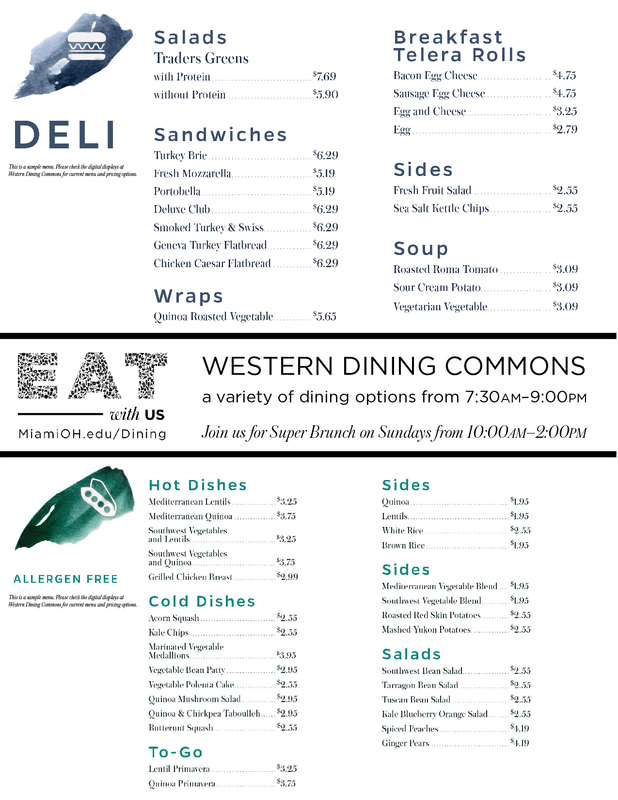 The meal options at WDC are comparable to all the most popular venues on campus. 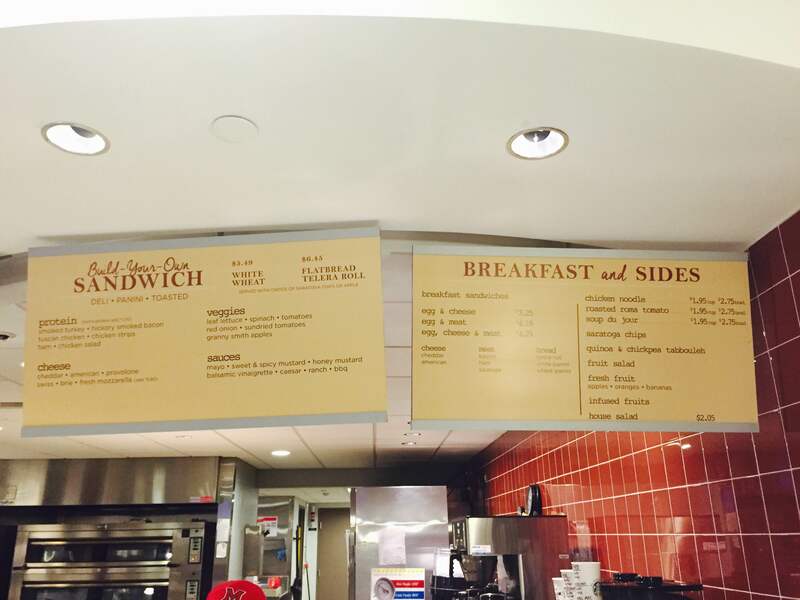 For example, today for lunch, both Armstrong and Western Dining Commons are serving various flatbreads, salads, chicken wings, and sandwiches; as well as various to-go options. If you’re looking for a calm place to eat that might be a bit quicker, Western is the perfect place to check out. If you love Italian food, you’ll love La Mia. In this sit-down style restaurant (carry-out is also an option), you have your choice of fresh salad, homemade soup, hearth baked pizzas, made-to-order paninis, subs, wraps, pastas, desserts, and fruit smoothies. Pretty much anything you could ever need to satisfy your hunger. La Mia is offering 10 Minute Lunches. These are half portions of La Mia favorites such as fettuccine alfredo, meatball sub, chicken Caesar salad, and spaghetti and meatballs. Great on-the-go or for a sit down meal. ALSO, the family-style lunch, served from 11am-4:30pm is a new dining option. For $28, you get entrée, salad, breadsticks, and drinks for 4! Be sure to check this out with your friends for longer breaks between classes or an early dinner. This is a great place for students looking to treat themselves with the ambiance of an open kitchen environment. La Mia is in the same building as Harris over in South Quad. Both meal plans and credit cards/cash are accepted here and it’s a great place to take a visiting parent. Harris is wedged between Anderson Hall and Stanton Hall over in South Quad, which is located behind Central Quad (sorority housing, look for the famous sundial with turtles around it!). Harris is great for a lot of reasons, but the most compelling reason for Harris’s greatness is that it is buffet-style and has a lot of options. So you walk in, pay at the register, and then the buffet is all yours! Miami Spice features custom-made pastas. Sonora Stop has burrito bowls, quesadillas, nachos, and tacos. 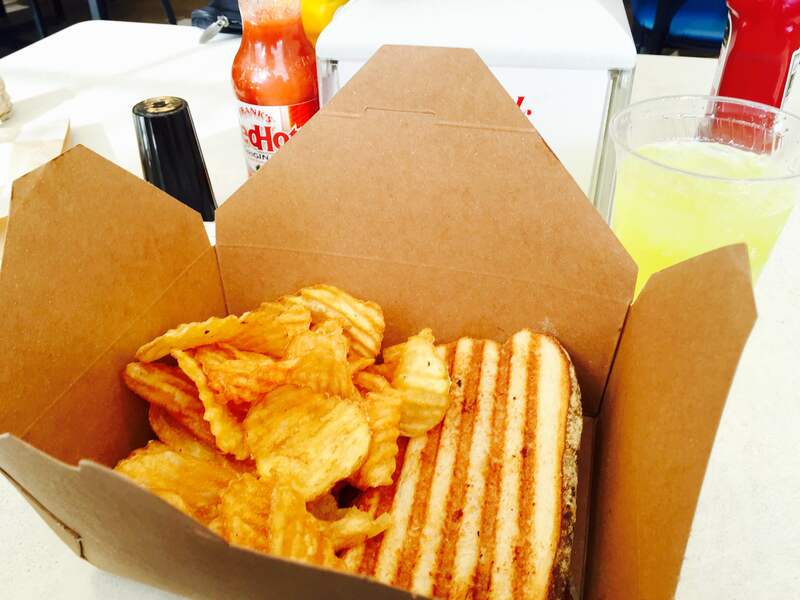 Campus Grill serves up burgers, grilled cheese, and other fried foods. Miami Traditions is a station that changes daily and serves meals that you might find at your next family dinner. There is also a fruit and salad bar! 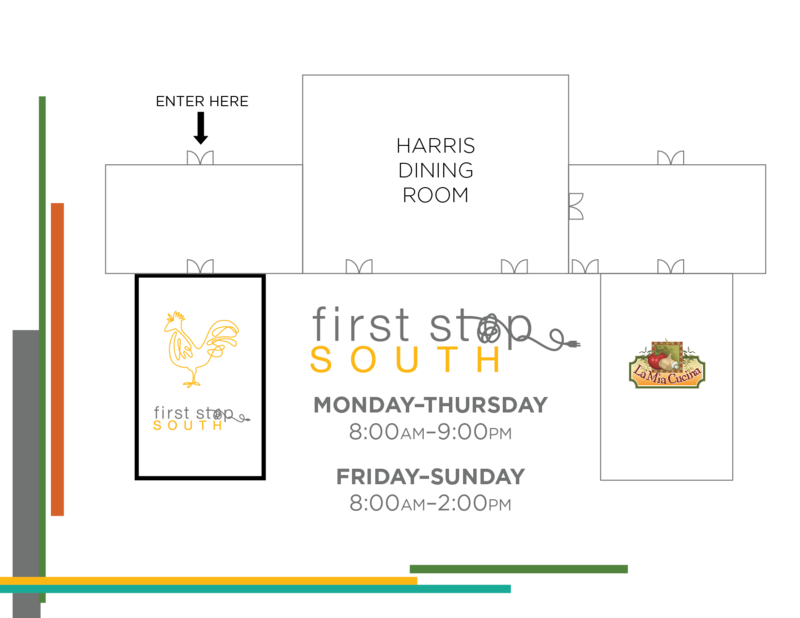 Don’t forget about First Stop South for when you feel like breakfast—open all day! Get your hotcakes, waffles, benedicts, omelets, fruit plates, and cereal whenever you feel like it. 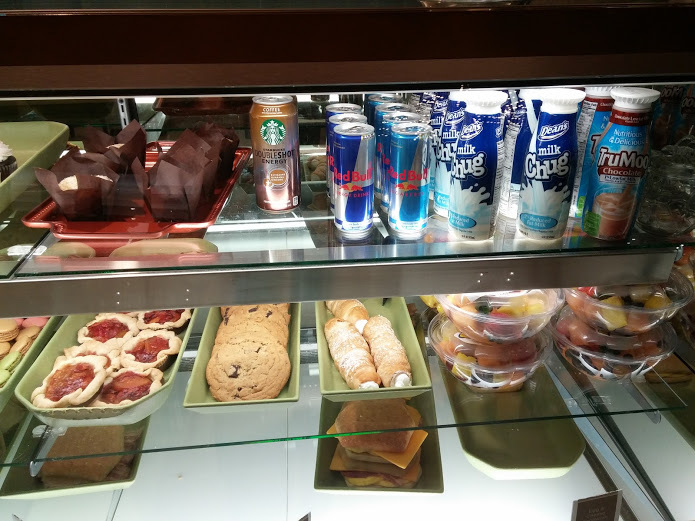 Keep in mind that there is also an express breakfast option for on-the-go nutrition. Did you know that the First Stop South location in Harris has the exact same menu as the First Stop restaurant at Maplestreet? If you’re ever in the mood for a chocolate chip muffin, strawberry waffles, an omelet, or any other luxurious breakfast item on the menu, stop by either location! It’s impossible to be sad when you can get breakfast all day. And hey, if everyone already beat you to Maplestreet, walk across the road to First Stop South and get yourself some good food. How to enter First Stop in Harris. Dividends is located over on East Quad in the Farmer’s School of Business, across the street from Pearson, and next to Cook Field. There are several delicious (and speedy) breakfast and lunch options at Dividends. 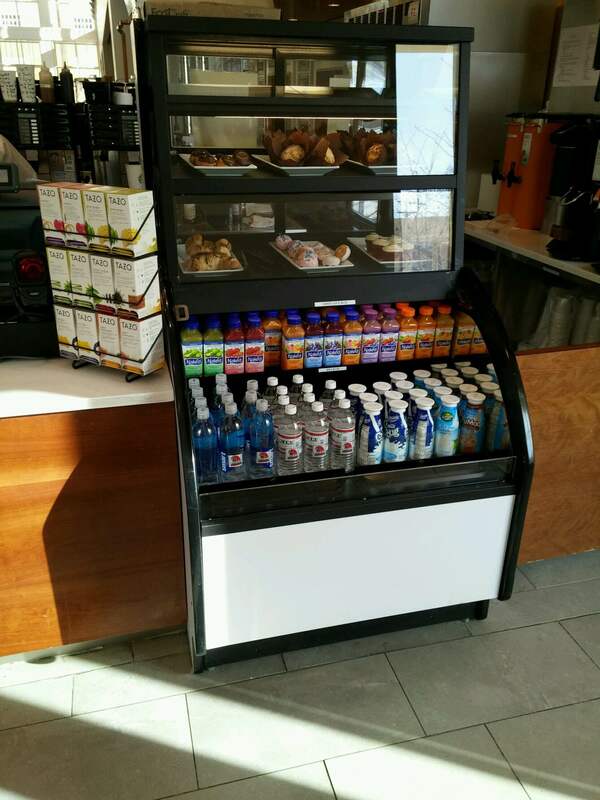 For a swift breakfast, Dividends offers coffee, tea, fresh baked cinnamon rolls, fruit, and pastries. For lunch, there are many more options. There’s an Asian Market that serves sushi, dumplings, rice, spring rolls, etc. There’s the Panini Portfolio that serves—you guessed it—paninis. Preferred Stock serves soup. And finally, Trader’s Greens, serves the famous Dividends salad; a giant custom salad bar with over 50 toppings. Meal plans are accepted and if you’re paying with cash or credit, there’s a $3 off coupon in Campus Special! Our first Super Brunch of the year is tomorrow! Western Dining Commons from 10-2. Put a reminder in your phone! 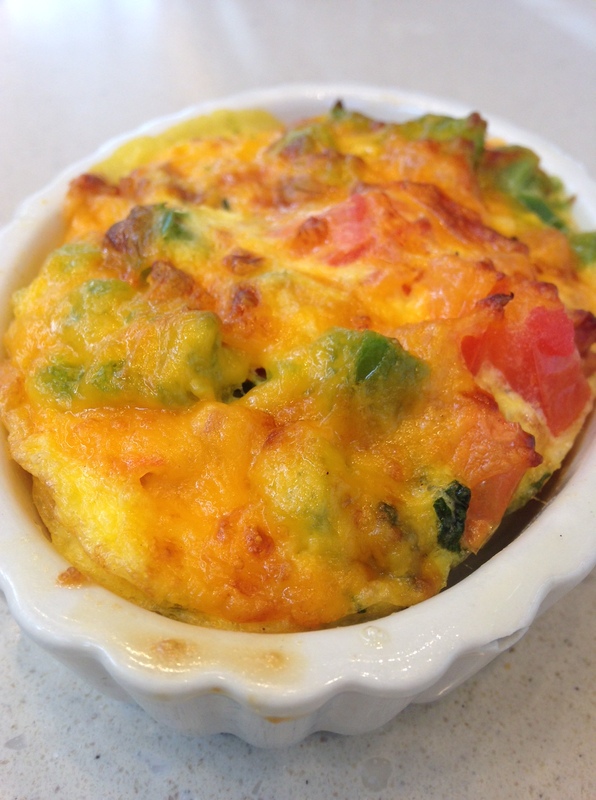 Along with crepes and various other menu items, Frittatas will also be served. To make a healthy start to your Sunday, choose egg whites and plenty of veggies! Frittatas will also be served at Super Brunch. They are customizable with your choice of fresh fillings including veggies, meat, and cheese, then mixed with egg or egg whites and baked to perfection. The brunch of all brunches will be coming to Western Campus on Sunday the 7th at 10am. This brunch will be buffet-style with your choice of eggs benedict, frittatas, crepes, scrambled eggs, bacon, sausage, waffles, smoked salmon flatbread, and so much more. For those of you who remember the 1809 brunch, Super Brunch is like that, only bigger. Super Brunch will be an every Sunday occurrence (unless otherwise stated) for the rest of the semester and the hours are 10-2. Get your friends together and go brunch. 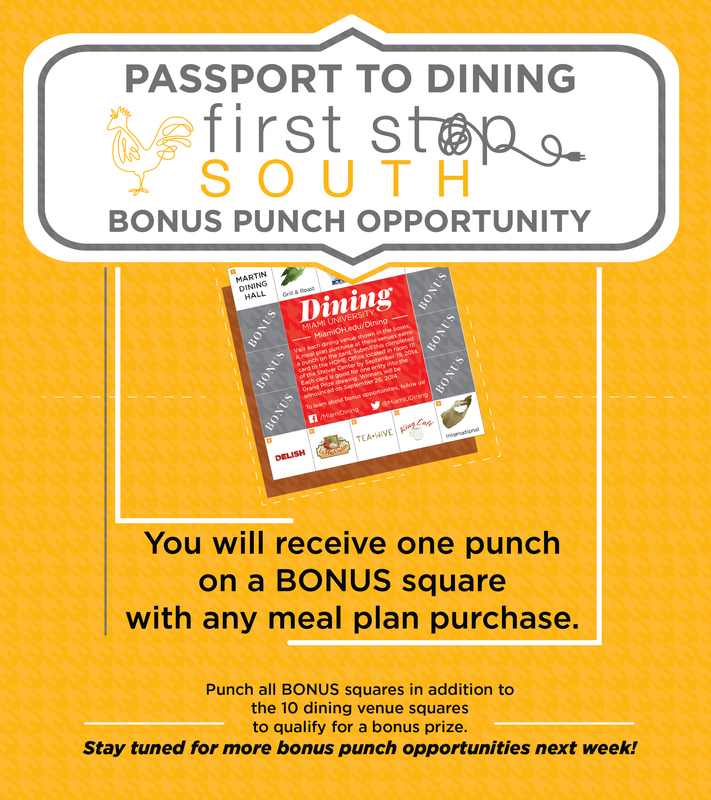 Dining Passport Bonus Punch Opportunities! Now through Tuesday, eating at First Stop will get you a bonus punch on your Dining Passport! 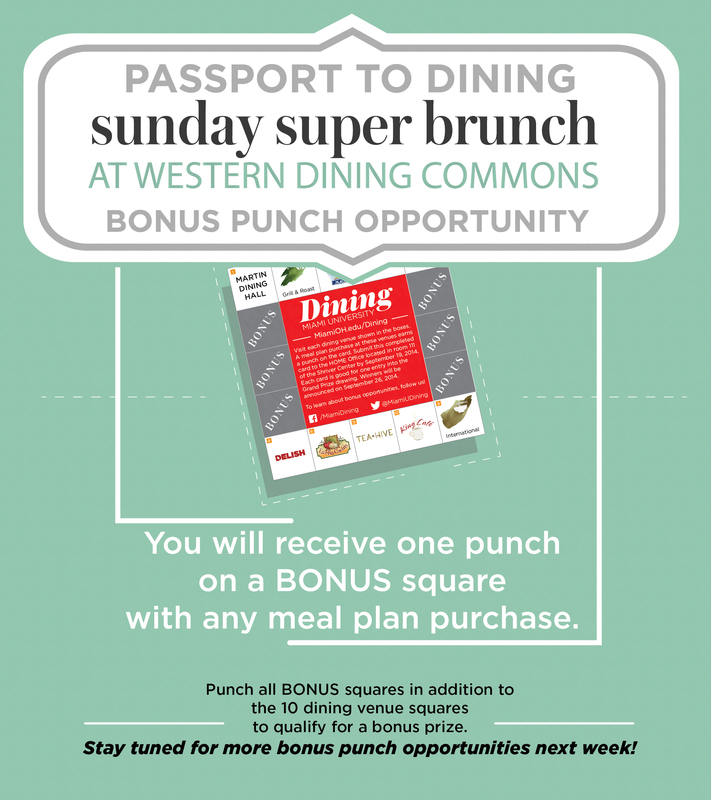 For the next two Sundays, attending Super Brunch will get you a bonus punch (if you remember to bring your Dining Passport)! Americas and Delish (in Maplestreet Station, on Maple Street, near the Center for Performing Arts, and across the street from Minnich Hall). Delish is a modern American sandwich shop. There’s a build-your-own sandwich line and enchanting grilled cheese sandwiches that will get you hooked. Great for lunchtime combos of soups and salads and sandwiches, if that’s what you prefer. Exciting news on Americas menu! Cincinnati Chili Dogs (Woot! Woot! ), Chimichanga, Po Boy Sandwich, Crab Cakes, Bratwurst, Potato Casserole, Fish Taco, Philly Cheesesteak, Saratoga Chips with BBQ, Cheese Curds with Ranch, Enchiladas, and more. Get out there and try something new! And don’t forget your Dining Passport!! As great as the new restaurants on campus are, we can’t forget about those that have been old favorites here. The traditional place on campus we recommend you visit today is Bell Tower Place. Lots of quick options here! The Bell Tower dining venue is located halfway up High Street, near its namesake Bell Tower. 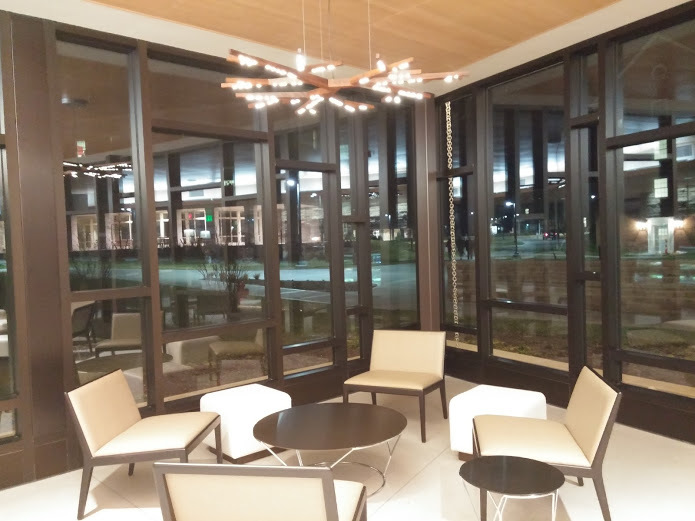 Its location is perfect for both on-campus and off-campus students. Upperclassmen—this is a great place to grab coffee or breakfast in the morning on your walk to class. If you’re interested in pizza, pasta, sushi, a burger, a donut, coffee, cake, a smoothie, onion rings, yogurt, a burrito, tacos, quesadillas, guacamole, egg rolls, a deli sandwich, stir-fry, fruit, or soup, Bell Tower Place is the place to be. 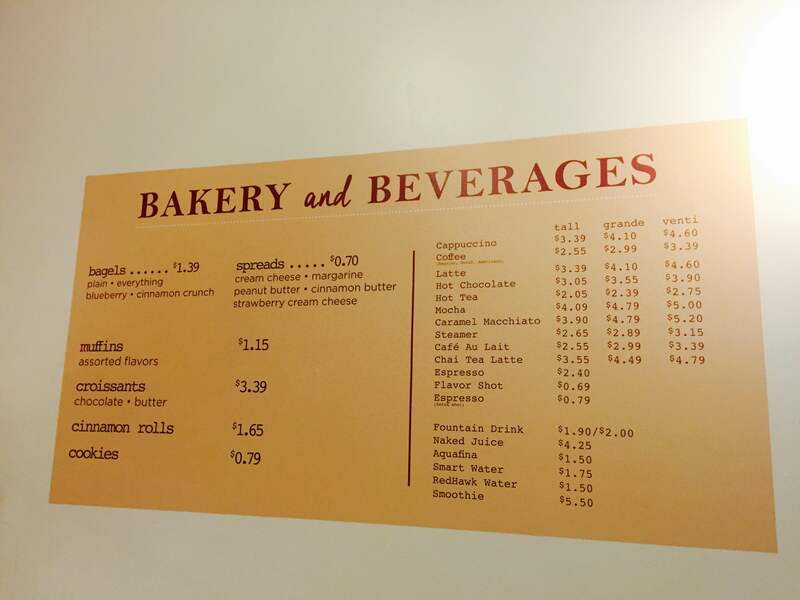 Haines’ Boulangerie is on the west side of Armstrong Student Center (literally the center of campus), behind Bishop Woods, next to Culler Hall, in front of Upham Hall, within site of the famous seal (avoid walking on this!). Campus map. If you can find any of those places, you can find Armstrong. If all else fails, find Spring Street and walk up or down until Armstrong is in sight—be sure to stay on campus! Pro-tip: Boulangerie: “a bakery that specializes in baking and selling bread” [boo-lanzhuh-ree] according to Dictionary.com. Boo-lingerie might be helpful too. Good luck. 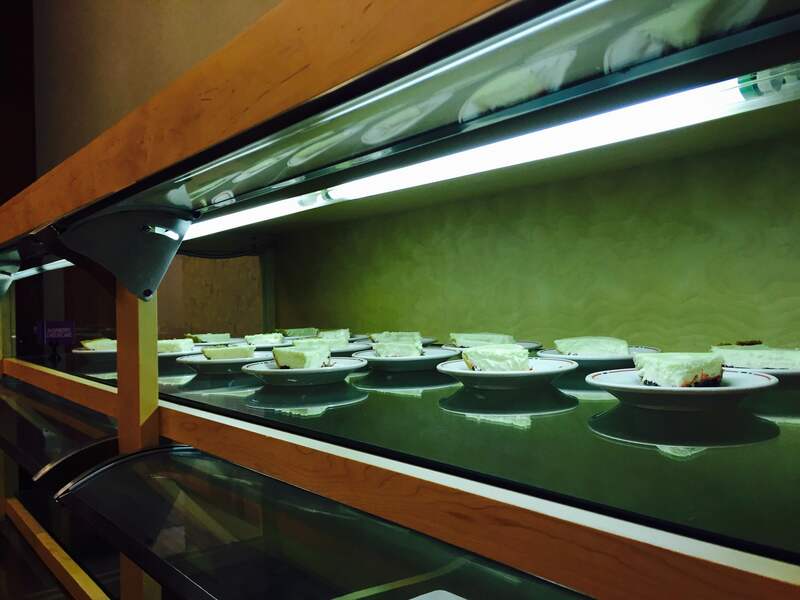 The Boulangerie features Panera-like eating options—flatbreads, paninis, soups, salads. This restaurant is not only super tasty, but also has a few vegan/vegetarian, low fat, and low calorie options. 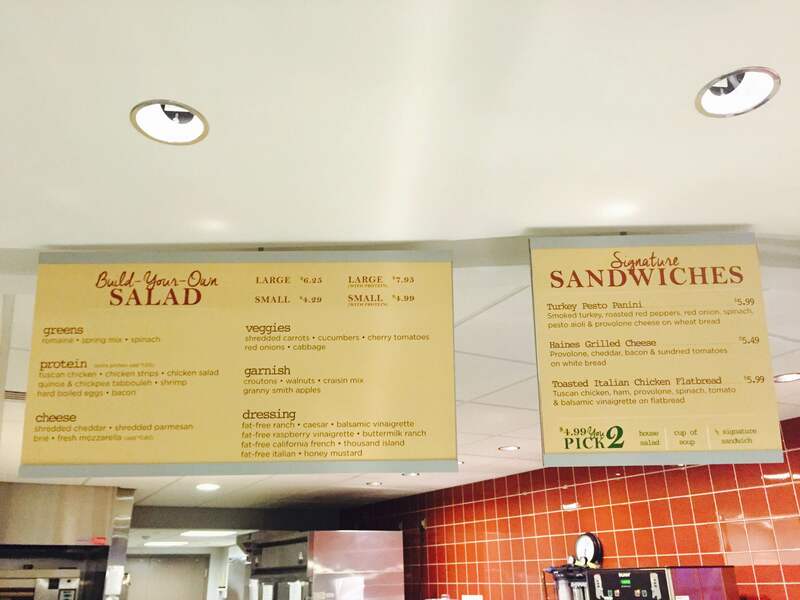 And also, lots of half combo options to choose from—half-sandwich, half-soup, half-salad. 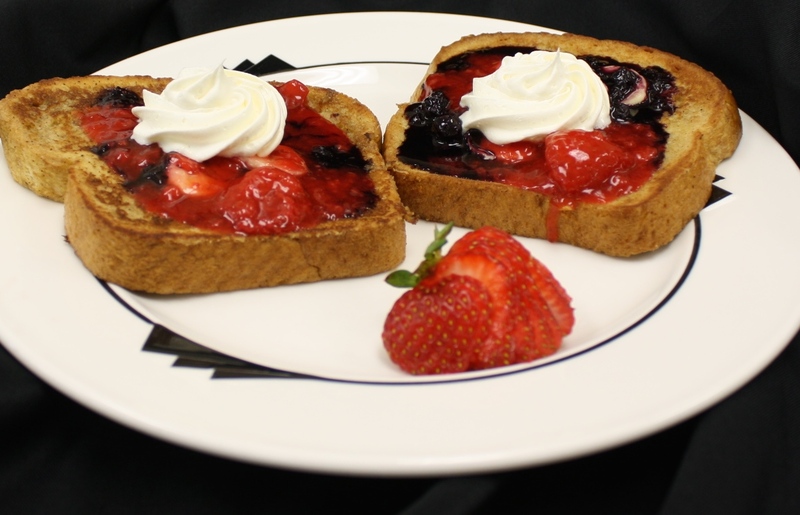 For breakfast, try one of our smoothies, parfaits, or pastries! 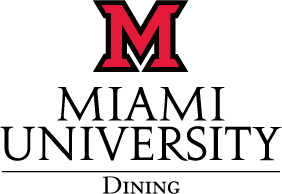 For students, both old and new, there are so many dining options on-campus this year. While change can be intimidating, it’s also very exciting. Through this blog, we will guide you through your dining experience this semester. Be sure to check back often, follow us on Twitter, and like us on Facebook for more updates and information. 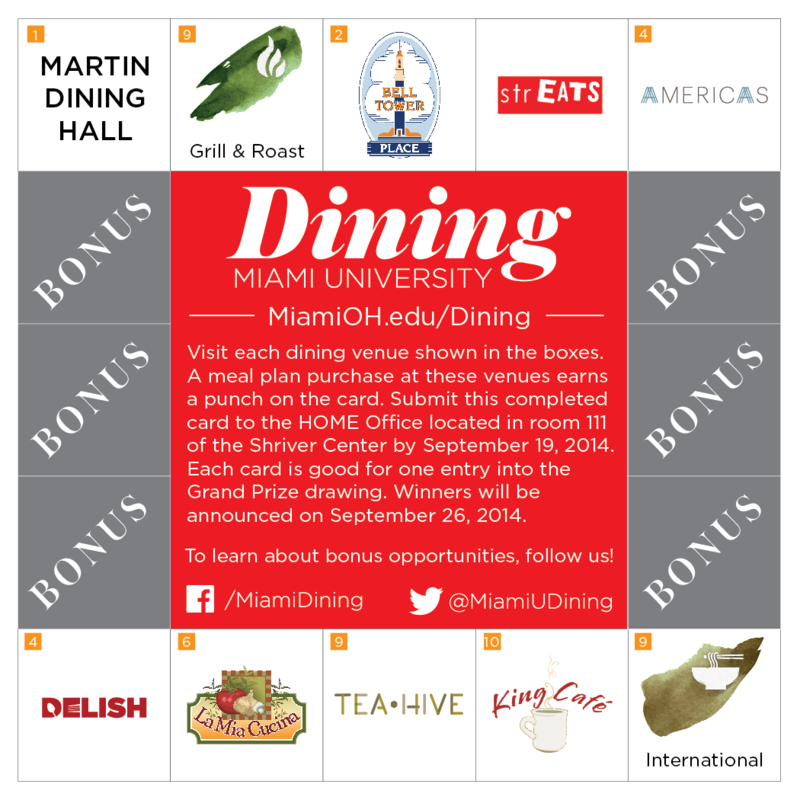 Don’t forget about the Dining Passport challenge that officially starts today! Pick up your Dining Passport from your first year RA or at the HOME Office (in the basement of Shriver). To view a map of these dining locations, click here. Once completed, turn your card into the HOME office. You will be entered for a chance to win the Grand Prize of a $250 gift card towards a new bike or one of two $100 flight vouchers. HINT: find two locations that are close together and visit them both in one day! To make trying new things a little more comfortable…. 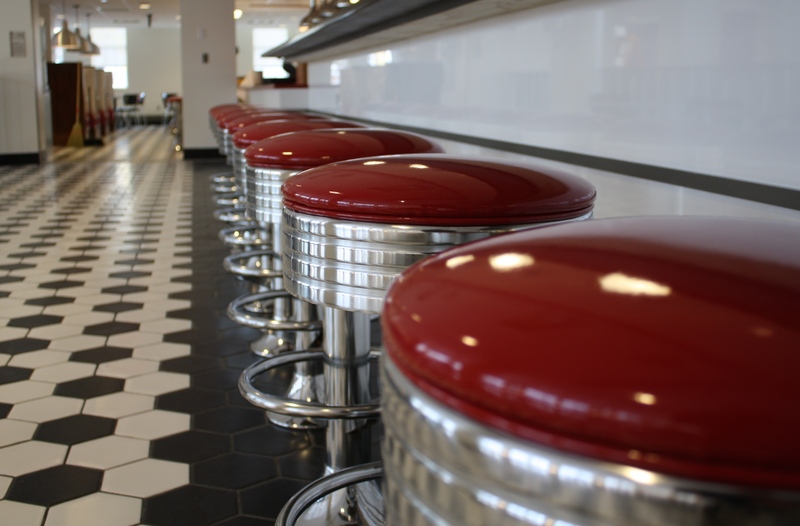 In all of the restaurants in Armstrong, walk up to the register first to order your food. From that point, you’ll either get a number, get a table card, or have to listen for your order nearby. Because Armstrong is so delicious and convenient, it’s always a bit busy, but don’t let that intimidate you! During peak hours, multiple registers are open. All your food is hot and made to order. As if that isn’t amazing enough, all of the eating utensils and to-go boxes are biodegradable and Armstrong composts the food waste. Yay, Earth! 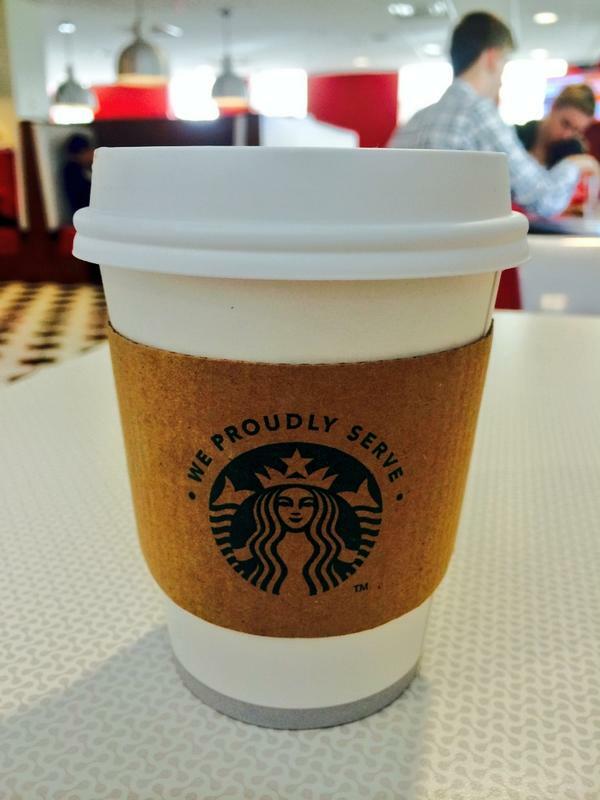 Make sure you get rewarded for your exploration of the campus during the next few weeks. FIRST pick up your Dining Passport from your first year RA or at the Love & Honor Event (dining will be there from 6:30pm-7:30 pm at Stoddard & Elliot halls—next to Bell Tower) or at the HOME Office (in the basement of Shriver). 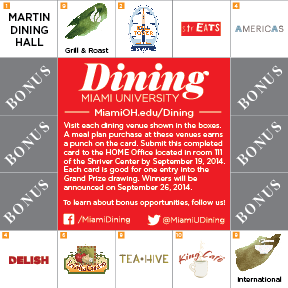 You must have your passport stamped and you must use your meal plan at these locations in order to win the prize. The dates of eligibility are from Monday, August 25 to Friday, September 19. In addition, several Bonus punch opportunities will be open through Tweets and Facebook posts. Keep your eye out for those! Once your passport is filled out, front and back, return it to the HOME Office (in the basement of Shriver). While the campus is still preparing for the return of our students, there will still be places on campus to eat. As far as pre-semester hours go, most restaurants in Armstrong are open for a majority of the days leading up to the first day of classes. 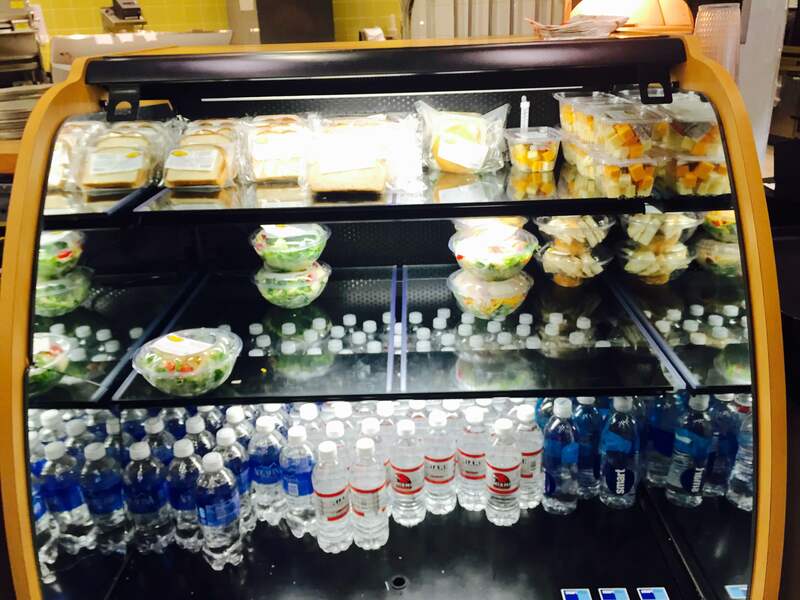 There is even a restaurant and a market within the student center that are open 24/7. Starting Thursday, Harris, Maplestreet, Martin, and Western Dining Commons all have hours during the day open to students. For full details on the hours that each location is open, click here.